Get ready for flu season! As we all know, when the colder weather arrives, so does the flu. It is hard enough to avoid when you are healthy, but there are certain groups that may face a higher risk of catching the flu, because their immune system may have a harder time dealing with infections. This group includes children, pregnant women, the elderly, and people with chronic illnesses. Whether you are in a high risk group or not, supplementation may be helpful for supporting your immune system, and improving your chances of avoiding some of the unpleasantness associated with colds and the flu. CaliVita ® International has several products which are designed to provide advanced nutritional support for a healthy immune system. SambuRex is a special blend of concentrated essence of black elderberry with echinacea, astralagus, and vitamin C in a fast-assimilating liquid form. Black elderberry has garnered attention recently, as a 2009 study** indicated that it may be helpful in not only alleviating uncomfortable symptoms of colds and flu (fever, headache and muscle pain), but also in reducing the overall healing time. Echinacea is a popular addition to many cold remedies, as some studies have suggested that it may be effective in helping to strengthen resistance, and mitigate the effects and duration of colds and flu. To complement and support the immune strengthening effects of Vitamin C, we suggest another popular liquid complex: Liquid C + Bioflavonoids with Rose Hips. This great tasting and easy to digest liquid is fortified with beneficial bioflavonoids and contains no artificial flavoring, coloring, or sweeteners, providing you with a great way to get vital nutrition for the cold months. Children may not always have the perfect diet. Kids Greens is a tasty chewable tablet formulated to ensure the little ones are getting the specially designed blend of key micronutrients they need during the flu season. Super Mega 50 is the ultimate multivitamin and mineral blend for adults, with 34 different key micronutrients in a single tablet. It is an easy and ultra-convenient way to ensure your metabolism is getting all the support it needs during times of increased demand. Whether it is hard physical work, sports, stress, or the cold winter months, Super Mega 50 has got you covered. Prevention is the best way to get around the flu. Order now these immune-system strengthening preparations by visiting Pharmavita on-line shop. ** Pilot Clinical Study on a Proprietary Elderberry Extract: Efficacy in Addressing Influenza Symptoms - Fan-kun Kong, PhD., Online Journal of Pharmacology and PharmacoKinetics, Vol. 5: 32-43, 2009. 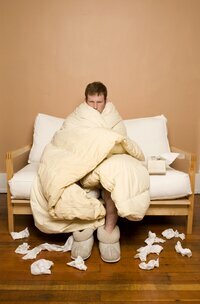 Once again the flu season is approaching and experts estimate that it will reach us within a few weeks’ time. The symptoms of the flu are fever, coughing, malaise, which place a strain on our body and we are also forced to stay away from work. In addition to the “familiar” winter flu, a different viral epidemic, the noro virus is also on its way, characterised by vomiting and diarrhoea besides the above symptoms. As vaccines need about two weeks to ensure protection, it is worthwhile to prepare ourselves in time with other, natural active agents as well so that we can be sure to avoid the flu this year! If you start preparing your body right now in good time, you can choose from a range of effective, natural preparations so that you can deploy the full arsenal of your immune system against the siege of influenza. Certain studies claim that elderberry, which is found in SambuRex in great quantities and concentration, can relieve the symptoms caused by influenza extremely effectively, while it can also shorten the time spent ill (by up to 4 days!) and it can also reduce the amount of medications needed to fight the symptoms and complications. In addition, it stimulates the protective mechanisms of our immune system against the flu virus, preventing its “multiplication” and it also has an inhibiting effect on certain types of bacterial infections, occurring as the complications of viral infections. (Similarly to prescribed medications but in a natural way). SambuRex is the tasty extract of elderberry and other herbs supporting the immune system (echinacea, astragalus) so it can also be ideal for children! It is free from alcohol so vehicle drivers and those operating machinery can also take it without problems. Vitamin D intensifies the defensive functions of the immune system against infections, while its deficiency makes you susceptible to infections! In an American study, women after their menopause were given 2,000 IU vitamin D3 daily and the occurrence of flu and common cold decreased by 90%. A Japanese study concluded with similar results, where school children received 1,200 IU vitamin D3 daily, which significantly decreased the number of those contracting influenza. According to the expert opinion of the medical commission in Hungary, proper supply of vitamin D could decrease the occurrence of influenza by up to 90 per cent! Even in summer 50 per cent of people suffer from vitamin D deficiency but in winter this proportion may be up to 70 per cent. One drop of CaliVita’s D-drops contains 400 IU units of vitamin D3; its dosage is simple and can be customised; and its taste is pleasant with a slight citrus aroma thanks to the natural flavours. If you want to know more about the relationship between vitamin D and the flu, click here! Just like vitamin D, vitamin C is also indispensible to make sure your immune system functions properly, recognising foreign infiltrators, produce antibodies and eventually combat the infection by deploying more and more immune cells. Its efficiency against the cold and the flu has been supported by a number of studies. CaliVita’s C 1000 PLUS with extra bio-rosehip content tablet contains 1,000 mg delayed release vitamin C, which supports your immune system all day during the cold winter period. Besides, CaliVita also offers several other, excellent vitamin C preparations so everybody can find the most suitable product among them. Don’t live in fear, take steps in time! Prepare your body against winter diseases! For buying products, click here! If your medical history includes kidney stones, seek your physician’s opinion before applying the produce! Vitamin C is sensitive to heat and light, which must be considered during storage! Not recommended for people sensitive to Brassicales, patients suffering from autoimmune diseases and those taking immune suppressive medication. Not recommended for children under the age of 3! Its application is only recommended for a maximum of 8 weeks! To be stored in a cold place after opening! Shake well before use! Store the product away from sunshine! Do not apply it in conditions involving high serum calcium levels (hypercalcaemia)! In case you are applying other preparations containing vitamin D, consult your physician! The effect of herbal remedies on the production of human inflammatory and anti-inflammatory cytokines - Barak V, Birkenfeld S, Halperin T, Kalickman I., Isr Med Assoc J. 2002 Nov;4(11 Suppl):919-22. Anti-influenza virus effects of elderberry juice and its fractions - Kinoshita E, Hayashi K, Katayama H, Hayashi T, Obata A., Biosci Biotechnol Biochem. 2012;76(9):1633-8. Epub 2012 Sep 7. Inhibition of several strains of influenza virus in vitro and reduction of symptoms by an elderberry extract (Sambucus nigra L.) during an outbreak of influenza B Panama - Zakay-Rones Z, Varsano N, Zlotnik M, Manor O, Regev L, Schlesinger M, Mumcuoglu M., J Altern Complement Med. 1995 Winter;1(4):361-9. Ample evidence exists from human studies that vitamin D reduces the risk of selected bacterial and viral infections Experimental Biology and Medicine 2010, 235:1395-1396. Effect of vitamin C on common cold: randomized controlled trial - Sasazuki S, Sasaki S, Tsubono Y, Okubo S, Hayashi M, Tsugane S. Eur J Clin Nutr. 2006 Jan;60(1):9-17.